The tide works with the moon. If the moon is down, it’s going to be low water. If the moon is coming up, it’s going to be high water. 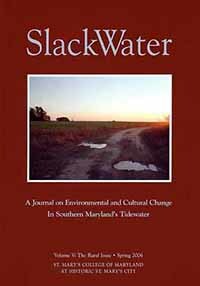 Slack water is when the tide is changing from one to another. When it stops going out, it comes to a standstill before it starts running back. 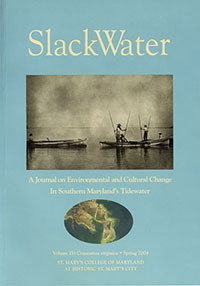 Water is the most manifest testimonial we have to the culture and land on this western shore of Maryland, framed by the Chesapeake Bay and the Potomac River and laced with smaller rivers and creeks. Looking out over the water, we see the flux of environment and culture. As we cross the Governor Thomas Johnson Bridge over the lower Patuxent River we sense we are a part of a larger picture that is always changing. We may choose to simply surge forward, focusing our energies on driving north from St. Mary’s to Calvert County, or we may allow our eyes to rove the panorama of river that fills our windshield, reminding us that we are part of a landscape that spans centuries—a deep tide of time. Though our senses may rejoice in such engagement, we may feel overwhelmed by the majesty and abundance of blue water. We take comfort in the river’s gleaming affirmation that, somehow, the work of creation is done. Deep down, though, we understand that the river’s continuance is a call for us to reach beyond ourselves and connect our lives with those of the past and the future. 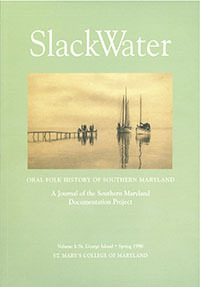 In examining the challenges and transformations of the 1960s and ‘70s, one may question whether the term “slack water” is indeed an appropriate metaphor. The civil rights movement, women’s rights, Vietnam, the Cold War, the space race, a growing environmental awareness, counterculture, and even rock and roll music profoundly reshaped our nation. So, can a word describing the pause between the tides apply to such restless times? Yes. Slack water does not imply a standstill in the sense that no movement occurs; it is rather a productive tension before the tide changes course. Slack water is not a stasis, but stillness, a breath that creates an opportunity to deepen understanding and insight. 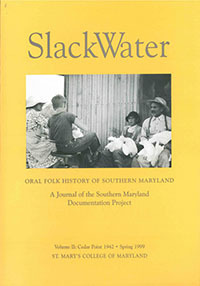 This volume of SlackWater examines testimonials in Southern Maryland that illuminate the transformations this region experienced during the 1960s and ‘70s. 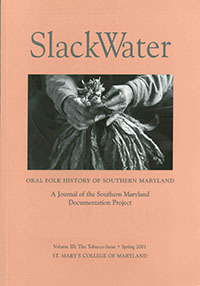 Part I of the journal, “Watershed Elegies,” affirms that the ‘60s, although not the beginning of change for Southern Maryland, was nonetheless a watershed event. Watershed Elegies focuses on the perception of change as loss. These stories reflect a deep nostalgia for the way life once was or the way life is imagined to have been. Although many of the stories in Watershed Elegies are quiet memorials, in others we glimpse the perspectives of those who see change as progress rather than loss. These narratives suggest that we, ourselves, are fashioned like works of art with the tidewater carving poems into the smooth sands of our being. This concept of change as transformation takes us into Part II, “Passages to Change,” in which diverse voices speak of political activism, excitement, and anguish. Local stories, imbued with the passion of the dreams they commemorate, are silhouetted against the wide canvas of our nation. The stories and visuals in Passages to Change pull the past into the present and enable us to see how the impact of the ‘60s and ‘70s is everywhere evident today. This negotiation between past and present voices leads us into Part III, “Visions and Instant Cities,” where we plunge in and penetrate the surface, taking note of how the two decades’ changes have literally given shape to what surrounds us today—bridges, highways, parks, and colleges. Together, these stories draw attention to how change in Southern Maryland also takes form in what is not visible: no slot machines, no oil refinery, no deepwater port, no schools for white children and no schools for “colored” children, no separate entrances for whites and for African Americans. Today’s landscape is a chronicle of changing tides. A slack water pause between the tides could be seen on the National Mall on January 20, 2009, when Barack Obama took the oath of office as our first African American president. In one sense, the sea of humanity between the Lincoln Memorial and the United States Capitol constituted a shifting tidewater, a literal and figurative pause between two very different administrations. On inauguration day, the same mall that had so often been filled with protestors during the ‘60s and ‘70s, was filled with hopeful and expectant Americans waiting for the tide to change. Born in the ‘60s himself, Barack Obama is testimony to the turbulence and great dreams of the last 40 years, a flesh-and-bone monument who moves amid the white marble and stone of Washington, and who will become part of a narrative of change yet to be written. Whether or not those who stood between the Lincoln Memorial and the Capitol steps during Obama’s inauguration were conscious of their own symbolic identity flanked by the Reflecting Pool and the Tidal Basin, they inspire us all to reflect on ourselves and our times, and to see ourselves as living narratives to the changing tidewater. 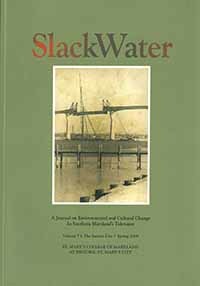 SlackWater urges us to plumb the depths further, to look past our own reflections and confront the rich complexity of life beneath the surface. 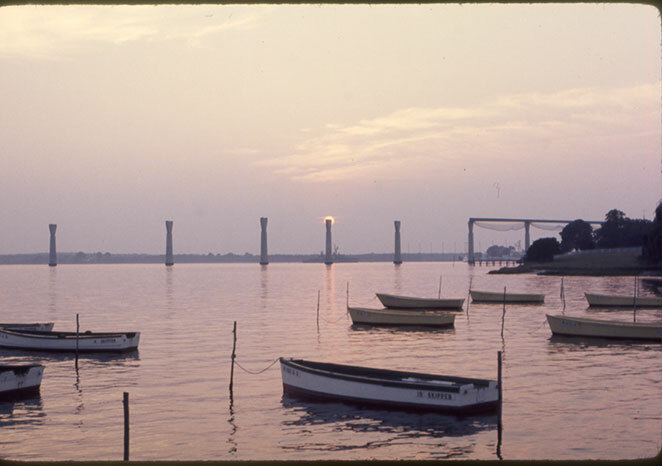 Boats at sunset. August 1976. Calvert Marine Museum.